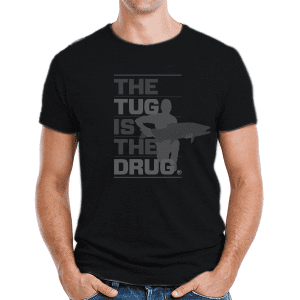 The Tug Is The Drug®. That nagging addiction is the reason we brave frigid coastal downpours in January, trudge through rattlesnakes and tick-infested brush in high-desert summer streams, or keep one eye open as that grizzly makes her way up the riverbank in search of an easy pre-hibernation meal. Yes. 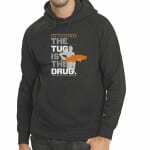 The Tug Is the Drug. And it’s the taste of the tug that keeps us coming back for more. Heavy duty 10 oz. 80% cotton / 20% polyester Gildan hoodie is like a wood stove tucked under your Gore-Tex. Full-sized but fitted through the chest and shoulders, you’ll appreciate the freedom to move. 1 × 1 rib with spandex, matching jersey hood lining, neck twill tape and draw cord, double needle stitching and underarm gussets. 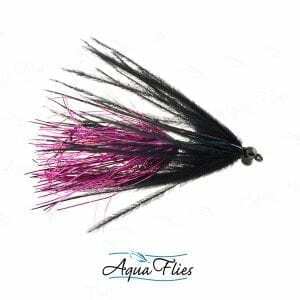 Fabric is pre-shrunk and pre-washed for soft hand feel. Choose between black or charcoal. Or both. 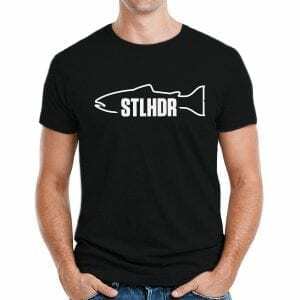 Designed and printed in Portland, Oregon.